No matter which way you slice it, getting from Minnesota to Southeast Asia is a time consuming exercise. Because this trip involves some intentional layovers, and was a bargain-basement fare, our travel day was a bit longer than usual. Fortunately, it was highly uneventful as well. The long flight, from Seattle to Hong Kong, consisted of movies, snoozing, and work. The Hong Kong airport is delightful, and after a slightly delayed departure, we made it to Kuala Lumpur around 1am. 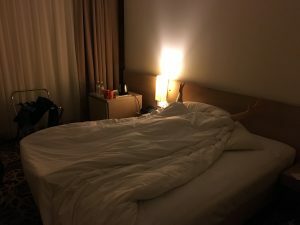 Thankfully, our accommodation for the night was an in-terminal hotel – no need to go through customs or anything. We basically walked right from the plane into bed. A relief. After a rest, we got up with a day to kill in KL. First things first, we went through customs, and then left our bags with the luggage storage folks. They must not see a ton of business, as they walked us all around the airport to have our bags X-rayed, and then brought us into the employees-only area to lock them up. Then, as most conversations in Malaysia do, we turned to food – they were excited to offer ideas for where we should get breakfast. We jumped in an Uber, with a vague destination in the city. 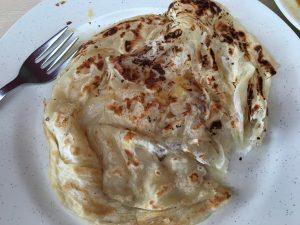 Our driver was amused that we had no actual plan for the day (or destination for drop off) so he offered to take us to a favorite of his for some roti canai, and we happily agreed. The three of us shared kopi and tea while we devoured our roti. In fact, ever meal we ate today ended up being based on his recommendations. Last time we were in Malaysia, we only had a brief stay in Kuala Lumpur, right at the start of the trip. 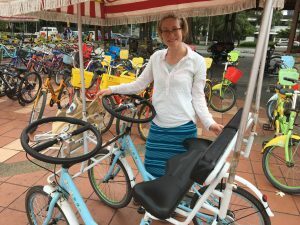 We hadn’t yet settled into Malaysian culture, and didn’t really get the city – it seemed mostly like a big, modern city. This time, we understood KL a bit better, and had a great day poking around. 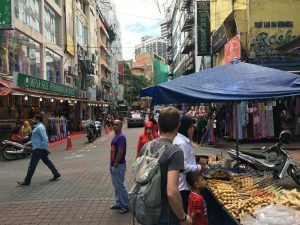 We took a leisurely stroll through colorful Little India, grabbing a street donut and some snacks at a market that was just starting up for the day. Kat was drooling over the gorgeous silks pouring out of every storefront. Malaysian women’s fashion is conservative but extremely expressive and feminine. 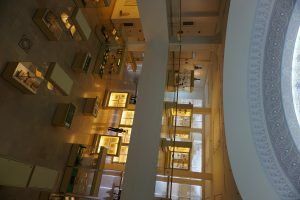 We ended up at the Islamic Art museum, which we were unable to visit last time. 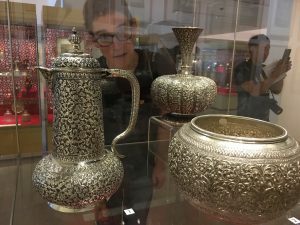 The Islamic Art museum is a stunner – a gorgeous space, with well designed exhibits, and thankfully, english signage written with a non-Islamic audience in mind. Kat tried her best to photograph everything in the the museum and Colin was exceedingly patient. We started in the illuminated manuscripts, wound our way through the Quran gallery, into the architecture room. 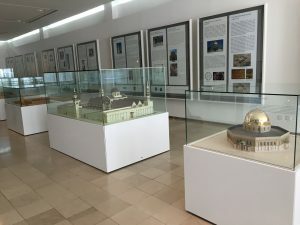 This gallery housed tiny versions of famous mosques around the world and highlighted the wonderful diversity of architectural traditions. 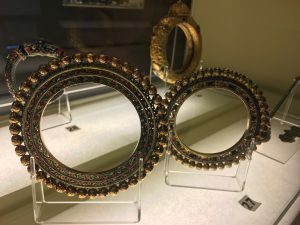 Next we passed through the India and China galleries and moved on to textiles, jewelry, weaponry, furniture, metalwork, ceramics and glass. The textures and colors were breathtaking. After a coffee at the museum we took a “just looking” visit to the gift shop – though the extensive book selection was extremely tempting. We stepped outside and caught an Uber back north for lunch. Another great Uber driver – today was his third day driving, on a break from his studies. We were his first Americans. He was sad that our new president means he probably won’t be able to visit the US any time soon. 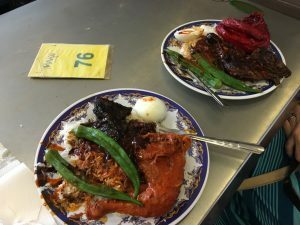 Lunch was nasi kandar, the “pile random things on a plate and somehow it becomes magic” dish that we can’t get enough of. Basically a lot of pointing and smiling gets you a plate of heaven that is different every time but always mind blowing. Someday, someone will start a fast casual Malaysian chain in the US and folks will fall in love. Meal number two out of the way, we wandered north, vaguely towards meal number three. 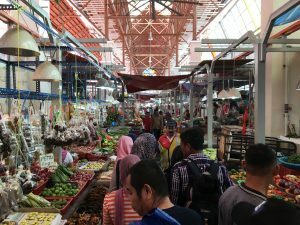 We stumbled upon a massive indoor and outdoor market – wet market, fruits and vegetables, dry goods, fabric, etc. Colin spent some time fantasizing about all the meals he could cook if we lived here. As a pedantic cook, there’s ongoing frustration over ingredient sourcing back home, even with some great Asian groceries. Our wandering took us through a massive hospital complex (fun fact: Malaysia is in the top 10 for medical tourism destinations). We ended up, unintentionally, in a construction zone with no obvious way through, but a construction worker waved us towards a break in a fence, which took us on a short wooded path, over a stream, and into another neighborhood. We ended up at Titiwangsa park. On a bright clear Sunday the park was bustling with happy families enjoying the numerous vehicular options – squeaky tandem bikes, four person pedal carts, tiny electric cars for the kids – you name it, it was available. So of course, we rented ourselves a ridiculously rusty, flat-tired, two person bicycle cart and set off around the lake. Trying to remember to keep to the left (ex-British colony after all), we explored the park in our creaky trolley. The park boasts an extensive network of wide paved pathways explicitly for this reason and we had a fabulous time zooming over bridges and around playgrounds and snack stalls. We finished our ride around the lake and attempted to return our trusty vehicle, however the man refused to accept it back because we hadn’t used our full hour. So off we went again, past the helicopter rides, inflatable human sized hamster balls, rental boats, and kids selling homemade brownies until we reached a drink stand where we bought a mango lassi. Another pass through the playground and it was time to return our adventure mobile. We walked a bit further around the lake, found a nice bench and sat for a while. Kat painted a tree covered in vines and ferns and Colin read a bit. After a while we headed across the street for our third meal of the day – Char kway teow. We soon realized that 4 pm opening means “we might start to get things together around 4..ish… maybe”. Luckily after a brief of a procrastination wander, we followed some locals and headed in for a quick plate of noodles. Though tasty, it was not quite the same as the char kway teow in penang. Another uber to the airport and a check in with our friends at the left baggage counter had us on our way to our next flight. Next stop Hanoi. Wow! What a day, especially after that long trip. Thanks for all the great descriptions and photos–so glad you got to the museum and found that park. Thanks for calling last night–happy new year!